A place to call home: Catholic bishops call for urgent action. 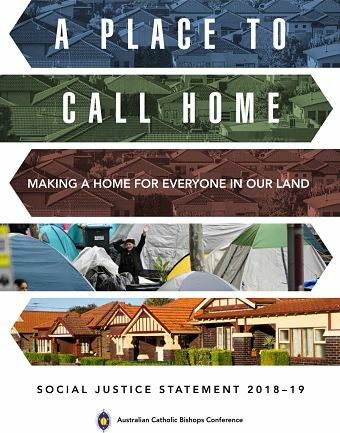 It’s time for Australia to reassert the value of housing as a basic human right”, proclaims the 2018-2019 Social Justice Statement from the Australian Catholic Bishops Conference. And quite rightly! A strong human rights perspective correctly guides and colours the entire statement on housing and homelessness in Australia with the statement basing the reaffirmation of those human rights on the unequivocal commitment both of the Gospels and Catholic Social Teaching to the powerless and the poorest. From these foundations, the Bishops’ statement critiques, with great clarity, the weaknesses of Australia’s housing policy directions and at the same time offers possible ways forward that are more just and inclusive. It would have been easy to call out the scandal of homelessness in a society as affluent as ours and challenge the consciences of citizens to rally governments for more emergency housing, social housing and funding for welfare agencies to increase access to safe and secure shelter for those on the streets or in risky accommodation. This indeed is a very significant part of the overall statement with special attention given to women and children fleeing situations of violence and abuse and in need of immediate shelter and aid. On this spectrum lie households experiencing housing stress. As Peter Mares reports in an article in The Age of 17 September, “One in every two low-income households renting in the private market is in housing stress. That is about 600,000 households spending at least 30% of their disposable income, and often much more, on rent.” Such households are a whisker away from homelessness and dependency upon welfare organisations. 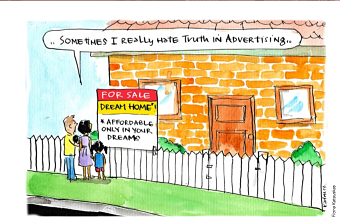 The increase in housing investment properties, made easier by government policies on negative gearing and capital gains tax exemptions, has a direct impact on reducing the availability of affordable housing and pushing more and more individuals, couples and families into renting – more frequently now as a permanent option – and at the same time inflating rents and other housing costs. This directly and rapidly flows downstream, pushing people on low incomes into sub-standard housing or out of private housing and onto housing waiting lists. The queue waiting for public or social housing is years long, such has been the neglect of governments in the provision of this essential form of housing. The Bishops’ statement quotes the Productivity Commission declaring that, “Australia’s social housing system is broken.” This is the ‘spectrum’ to which the Bishops’ statement refers – a systemic dysfunction of interdependent parts each of which require fixing. The dysfunction must be tackled if we truly believe safe and affordable housing is indeed a human right. The reform must begin at Commonwealth and State government levels – ‘upstream’ if you like – to curb those policy directions that infect the system and negatively affect housing availability and stability. A good place to start would be the radical curbing and eventual abolition of negative gearing and capital gains tax exemptions, using those considerable savings to quadruple the availability of social and community housing. In conjunction with this, there must be a significant increase in Centrelink payments to meet basic cost-of-living expenses. States should consider imposing quotas on developers whenever land is zoned or rezoned residential, to compel them to allocate a proportion of all dwellings to be built as affordable housing for low-income purchasers or community housing groups. The statement calls for greater cooperation between governments, the business sector and the community to creatively address housing affordability and homelessness. Such a partnership, with a resolve to mend a broken system by putting the health and wellbeing of the community before profit, may well turn out to have an impact on the flourishing of the nation much more broadly than just providing affordable housing. Michael Yore has been a consultant to education and social services sectors in areas of mission and identity, Catholic social teaching, and leadership development. He was CEO of Good Shepherd Youth & Family Service, and later Director of Mission for the schools and welfare organisations auspiced by the Good Shepherd Sisters. He continues to provide consultancy services for Catholic Social Services Victoria and its member organisations.